I have two primary interests in Second Life. The first is to be a newcomer helper, mostly, at NCI. The second is that I enjoy photography. That said, I keep an eye open for freebies that I can point new people to, and I keep an eye open for free poses and animations in Second Life. 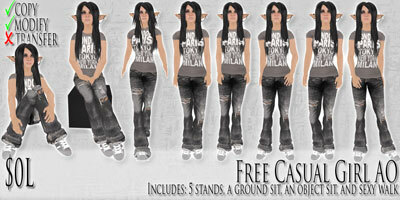 With that in mind, how can I avoid mentioning that Sugar Mill Grove is giving away free animations and poses. I thank Anicia Medici for her generosity, and creativity. Based on what I’ve seen in her store, her particular bent is not the so-frequent glamour poses that we see, but group poses, or creative and dorky stuff. Fun stuff is good! Check out the animations, and when you download the 15 free animations, either buy one that pleases you, to reward her, or simply send her a thank you note. People often forget that freebies take time, work and energy to created. Nothing quite warms the heart as someone who expresses their appreciation of it. Whoops! Noticed later that they are dollarbies. Still a great deal!